Think of every cop buddy movie you’ve ever seen and mash them together, and this would pretty much be the end result. Despite the presence of some great acting talent, this is more predictable and formulaic than the recipe for the three-minute egg. Hart follows in the footsteps of the likes of Eddie Murphy and Chris Rock by tackling this genre. He also shares a hyperactive energy with them, which is about the only thing that keeps the viewer engaged. 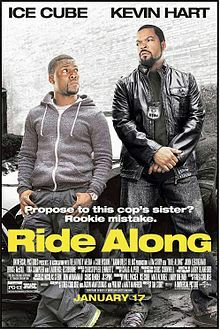 He plays Ben, a security guard who aspires to join the police force like his potential future brother-in-law, James (Ice Cube). However, James has never warmed to Ben, and on hearing that he wants to marry his sister, he invites him on a ride-along to give him an opportunity to show what he’s made of. However, although James plans to use the trip to ridicule Ben and convince him to change his plans, a real case that he has been working on for the past three years suddenly rears its head. As he tries to track down an elusive criminal called Omar, Ben thinks he has discovered some clues that will impress James, and get his blessing for Ben’s future plans. Ice Cube plays one tone throughout this – mean and deadpan – and while it initially works against Hart’s zeal, it quickly becomes boring, as does Hart’s over-the-top exuberance. The presence of Leguizamo and Fisburne gave me hope, but unfortunately, they do characters by numbers here. Given that they are both accomplished actors, this speaks volumes about the quality of the script, which is just one clichéed gag after another. It’s all been done before, and done better. This will definitely give you a sense of déjà vu. It thinks it has a couple of clever twists but you can see them coming a mile away, and there is a ridiculous amount of telegraphing throughout. This will kill a couple of hours, but it’s like fast food that you devour, that leaves you hungry again an hour later. An untaxing watch, this has apparently done well enough Stateside to get a sequel commissioned. It is the sort of movie that doesn’t leave you with any strong feelings either way, and it’s pretty forgettable, but if you just want bubblegum for the brain then this will do the job.